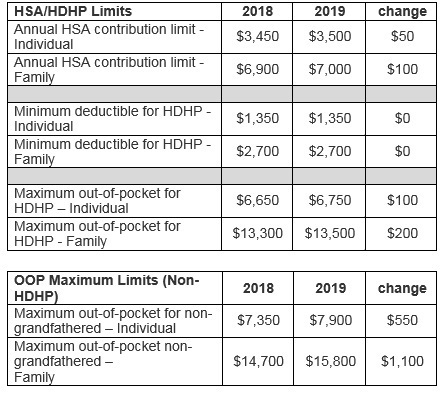 In our ongoing effort to prepare your plan for the 2019 plan year and beyond, we are sharing the recent guidance summarized below as it pertains to annual limits for Out-of-Pocket (OOP) Maximum and High Deductible Health Plans (HDHP). 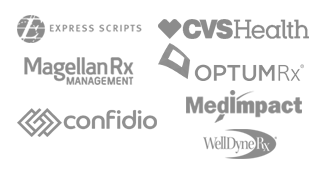 The Affordable Care Act (ACA) requires non-grandfathered health plans to establish annual limits on member Out-of-Pocket (OOP) expenses for all Essential Health Benefits (EHBs), including prescription drugs, not to exceed the specified annual OOP limit. The 2019 maximum annual limitation on cost sharing, as published in the HHS Notice of Benefit and Payment Parameters for 2019, will be $7,900 for self-only coverage and $15,800 for other than self-only coverage. The 2019 annual OOP limitations on high deductible health plans (HDHP), as published in IRS Revenue Procedure 2018-30, will be $6,750 for self-only coverage or $13,500 for family coverage. Please see the chart below for a more detailed comparison of the 2018 and 2019 limits.